Alright, I was supposed to get started on Carol’s Neighborhood RR this week, but I totally got wrapped up in working on Stargazer. I absolutely fell in love with working on her. I am now more than 2/3 done with the stitching and about half done with the whole piece (including the beading). I am really looking forward to the beading, even though there is tons of it. As of tomorrow night, I will be back into Round Robin mode for a while as I have one that I need to get done by the end of September and a second I would like to have done by then. I am also working on a new rotation in the hopes of making some progress on my numerous WIPS. There are several pieces that I really like in my basket, but just haven’t gotten to in a while. Stargazer will be my focus piece to start and I will work on her between rounds of my other WIPS. When she is finished, I will pick one of my other smallish WIPS to be my next focus piece. I am thinking about picking LTDs German Garden next. « If you like kitties, you’ll love this post! Wow, Leslie, it is looking gorgeous!! She’s beautiful! I love your fabric too. I’ve just bought this chart and am waiting for my fabric to arrive from Silkweaver. Isn’t it wonderful to be taken away by something we love stitching!? That’s the real joy and the reason we love stitching I think. Your Stargazer looks wonderful, and I know you’ll love putting the beads in. I can’t wait to see her progress more as you go along. Stargazer looks beautiful. I just love the fabric. She is beautiful and I love seeing your progress on this piece. Wow! You have done so much. I love the fabric you are working on. Is it hand dyed by you? It’s gorgeous!! You have so much done! She’s stunning Leslie – well done! She is going to be just beautiful when you get her done…I am working on one right now called “My Lady Of The Snow” and she is in different shades of blues, black, grays and white. I am almost done with the bottom half of her. I’m also doing a Hedge Hog picture too and I’m going to make that into a pillow when I am done with that. 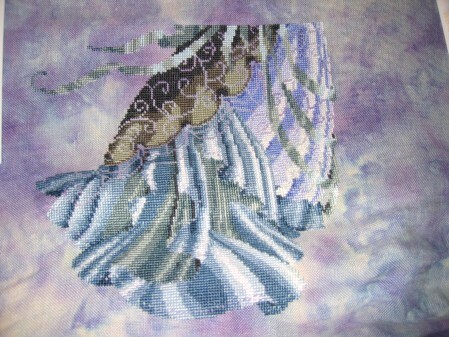 Keep up with your stitching…..
she looks beutiful so far! Wow she is gorgeous, the fabric is lovely too. No wonder you found this piece so mesmerizing – its gorgeous! Star Gazer is looking amazing, the fabric is gorgeous.